Since I didn't have to use my points to book VGC for later in the year (I used David's Rentals), the points I had earmarked for that trip were available. So I threw together a relatively last minute trip. And last minute in The World of Disney usually means you'll be staying at SSR. So that's what my wife and I did, five nights at SSR. More on SSR later. 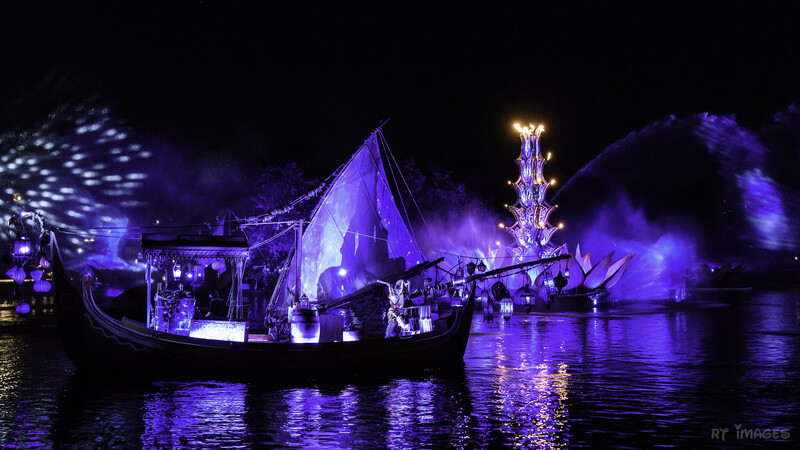 We said goodbye to Wishes and hello to Rivers of Light . We tried Tiffens. We tried Chef Art Smith's Homecoming. We ate at Tony's. And we did a bit of Flower and Garden. Before we left for this trip, I posted a sort of sarcastic alternative Disney list. One of the items on the list was "have you ever been run over by an ECV". Well, be it fate, karma, or coincidence, Saturday I was stuck from behind by a runaway ECV. More on that later. How does an ecv run away? If it is turned off it should not move? I use one and what to make sure mine does not run off into a lovely crowd. OK- they were filming a British TV show in the City Hall Hub area and it was packed. I was stuck from behind and spun to the side. When I had realized what was happening I grabbed the handlebars of the thing and held it until someone did something to stop it. Not sure who did what. Anyway, it seems the user of the EVC, a British woman, let her six year old sit on it with the key in it. The child, being a normal mischievous little boy, started it up and ran it into a crowd of people, me being the first of them. I wound up with a small cut on my calf. But I did wrastle that ECV until it could be shut off and in doing so saved countless lives. Yes, saved countless lives. For if those struck were not so agile and not possessing my cat-like reflexes, they may have perished. For my bravery and super-human feat of strength, I was awarded three fast passes and a bandaid. Just for clarification, that means that I had six fast passes in one day. Not too shabby. A fitting reward for your great bravery. What I learned about the TV show that was being filmed is that it is called Saturday Night Takeaway and it is a very popular variety/game show in the UK. All of the people in the grandstands, that were set up in front of the train station, had won their vacations on the show. I was eating on the terrace at Tony's while all this was going on. They announced that Cee Lo Green would be there, but I didn't hang around to see him. I was joking that he was going to sing the F U Song, you know, for all the kids to learn. Maybe one of our British Mouseowners could tell us about this show, because it seemed like a big deal. Getting a spot to film a TV show on Main St. in MK is big-time. At any rate, it made my lunch a bit more interesting and it made the park very crowded. Ouch. Just another warning not to let children sit on the scooters. It would seem free fastpasses fix everything.. NOT!! !